Controls brightness and a complex UV protection protects the best broad spectrum against aging skin. 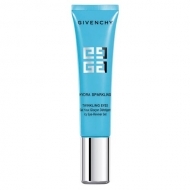 DESCRIPTION: Hydra Sparkling BB Cream Luminous Beige from Givenchy is a perfect fusion of makeup and skin care, created to enliven the skin with a dazzling shine. In one formula, there are 5 skin enhancement actions. The first is a unifying action, which simulates and illuminates all skin tones. A masking action enriched with light mineral pigments hides all the perfections and rednesses, while a smoothing action creates a soft focus effect. And finally, an equilibrium action controls brightness and a complex UV protection protects the broadest spectrum against aging skin. Formulated with Sparkling Water Complex to intensely stimulate hydration and cellular energy, facial skin is glow-brightened, while mineral and soft focus pigments soften and enhance the appearance of the skin. Apply in the morning to clean the skin.